Rugby Australia terminates $4m rugby contract with Israel Folau over Instagram post saying Hell Awaits You to Drunks, etc. 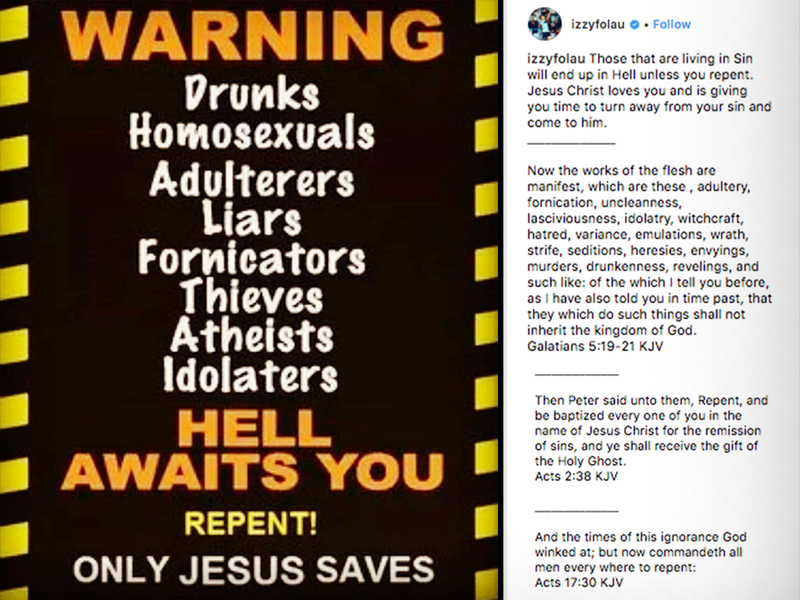 30-year-old Folau took to Instagram this week to post a picture that read, "drunks, homosexuals, adulterers, liars, fornicators, thieves, atheists, idolaters," will all, "end up in hell unless [they] repent." Folau was expected to be a key piece of Australian's national team in this year's Rugby World Cup in Japan. What's wrong with what he said? What's wrong with what he said? How much of his contract was guaranteed? Is it $4m USD, or Australian dollars? RE: Rugby Australia terminates $4m rugby contract with Israel Folau over Instagram post saying Hell Awaits You to Drunks, etc. 4/11/2019 3:10PM - in reply to What's wrong with what he said? He was warned last year to not post anything like that again or he'd be sacked. 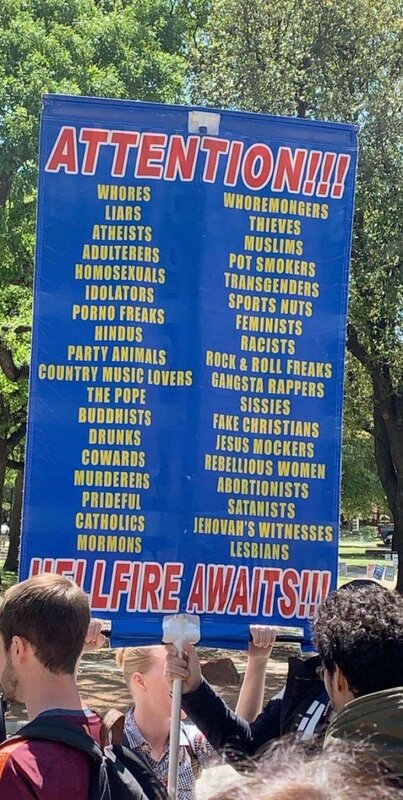 They only care about the homosexuals, adulterers, and fornicators, not the drunks, liars, thieves, atheists, and idolaters. "As a code we have made it clear to Israel formally and repeatedly that any social media posts or commentary that is in any way disrespectful to people because of their sexuality will result in disciplinary action," RA chief executive Raelene Castle said. Actually, they likely don't care much the adulterers and fornicators either. RE: Rugby Australia terminates $4m rugby contract with Israel Folau over Instagram post saying Hell Awaits You to Drunks, etc. 4/15/2019 4:16PM - in reply to What's wrong with what he said? It's the standard "code of conduct" farce where they purport to restrict your free speech in all aspects of life, with some self-serving "mediation" process if they claim you violate it, as a veneer of contract law. Of course, AU doesn't have such a free speech tradition as USA. But the unhinged nuts will bring censorship via economic constraint to you too. Can't have political freedom w/o economic freedom and all that. The Greek word used at various places is more apropos in translation as "sodomites" or sometimes "men who corrupt boys" (a subclass of the former in Greek culture). But the modern laziness can't even distinguish "homosexuals" into its subtypes (those who penetrate, those who are penetrated, those who mutually caress and jack-off, etc.). Look, Folau is clearly a conflicted young man, it's well known in Australia. Yes, typical Gay trick. Pretend that others are "closeted", rather than address the issues. Folau clearly has done so himself, in his own life. As his post says, REPENT! Was he acting on behalf of Rugby Australia when he made said Instagram post? Then why is it their business what cockamamie opinions he expresses? Sheesh, get a grip on reality already. The draconian days are multiplying. Another thirty years and rugby players who say that there is nothing wrong with homosexuality will be having their contracts torn up for offending the Muslim majority. God knows what will be happening to the homosexuals themselves. OZ is well on its way to becoming a .Muslim country. Definitely, what this LRC thread needs is a sound scriptural exegesis rooting in the precise meaning of koine Greek. Likely, Margaret Court would today be banned from playing women's tennis for her "code of conduct" violations. ”Country Music Lovers” ? That’s a bit harsh. Granted, no one wants to admit that they know Garth Brooks, and you have to question Willie Nelson, but even so that sounds like extreme punishment.